As people age, what can we do to improve their quality of life? “With the bam of a motorcycle I suddenly became the head of the family,” says Junaid Ahmed Qazi. While caring for the elderly is seen primarily as something that women are expected do, Qazi is defying the norms because life left him no choice. As an only child, life changed for him some 20 months ago when his father, a healthy man in his early 70s, became victim of a hit-and-run case. “Ten days before the accident we had both climbed five flights of stairs together.” What followed was a brain surgery, weeks in the ICU, and a nosocomial (hospital-acquired) infection his father caught, that left him invalid. “We believe he recognises us and has emotions. He wants to talk but cannot,” says Qazi. For him the sound of his father’s voice is a far-fetched dream. Yet the optimist in him refuses to give up. Qazi’s troubles are not unusual. The number of elderly people has risen globally with life expectancy having gone up due to advanced medical interventions. So has the corresponding number of their caregivers. The average life expectancy at birth of the global population in 2015 has risen to 71.4 years according to the WHO’s Global Health Observatory (GHO). HelpAge, a global network of organisations working with and for older people, predicts that by 2050 one in five South Asians will be over 60. The network states that South Asia is growing older faster than any other country in the world. While HelpAge’s Global AgeWatch Index 2015, that ranks countries by how well their older populations are faring, rates Pakistan at 92 out of 96 countries, healthcare professionals and doctors feel the close-knit family structure in Pakistan mitigates cases of neglect and abandonment of the elderly. With an increase in urbanisation and more Pakistani women joining the workforce, old homes and healthcare centres for the elderly is a discussion that is expected to come up more and more in the years to come. The need for geriatric medical care and for doctors specialising in the field has also gone up, and related challenges are multilayered. “There is a lack of awareness and an acknowledgement of geriatrics as a unique specialty with special needs, health issues and care requirements. This exists both at the level of physicians, and at the governmental level. Caregivers often do not understand the needs of their aged family members and the stresses involved in caring for the elderly,” says Dr Saniya Sabzwari who specialises in geriatric care at the Aga Khan University Hospital in Karachi. 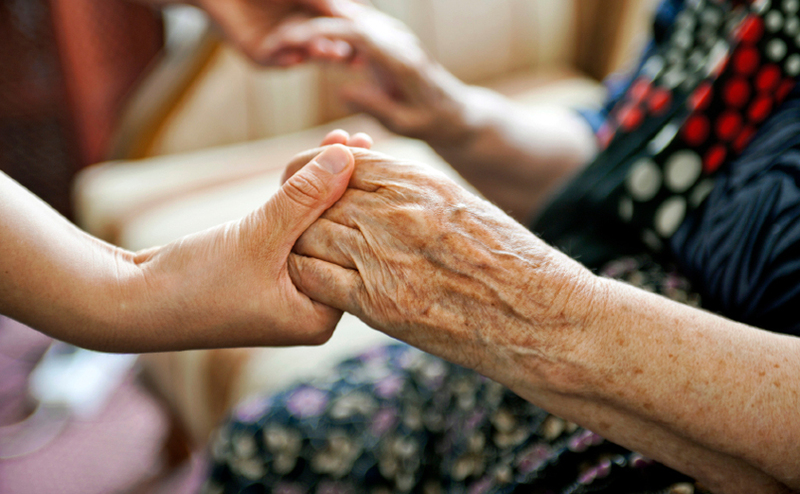 “Caregivers are the unsung heroes when it comes to geriatric care. They are also underappreciated. When Parkinson’s disease or Alzheimer’s strikes a patient, the entire family is affected,” says Dr Nadir Ali Syed, a neurologist at Karachi’s South City Hospital who has been treating elderly people for 25 years. The patience and endurance of caregivers are put to the test in more than one way and, practically, providing satisfactory healthcare to the elderly is an expensive proposition. “The biggest challenge is financial. Nursing care and attendants at home cost a lot. For those who cannot afford to hire professional healthcare at home, the challenge is even more daunting. It becomes physically difficult to look after an invalid person,” says Asma Nazeer, who requested that her real name not be shared. Nursing care at home for the elderly who suffer from a lack of mobility is expensive. Yet more and more people are opting for it. “The biggest determinant for better geriatric care is affordability — to be able to pay for quality healthcare,” affirms Dr Syed. Two round-the-clock certified nurses take care of Qazi’s father who, he shares, are pampered by him so that he does not have to go through the process of changing nurses and teaching them the ropes repeatedly. The price of nursing care at home is exorbitant but it still costs him less than the hospital would. His father’s room is now nothing less than the Intensive Care Unit of any hospital emanating the smell of medicines and sterilising liquids. Oxygen cylinders and the feeding tube through which liquefied food is transferred to his father’s stomach, like most elderly patients who are no longer able to eat by mouth due to multiple reasons, are maintained by nurses. But perhaps the biggest side effect of seeing your loved parent become a shadow of who they used to be is psychological. “We saw the stages where my mother would hallucinate and there were behavioural changes. But the most painful was the stage when she could not even lift her finger. For the last three years of her life she was fed through a nasal tube,” reminisces Nazeer. One of the jolts a family may receive is when they are told their loved one is now on what is called palliative or end-of-life care, a concept that is often not fully understood. The term does not mean that these are the final hours or days of the patient’s life. It means that the patient suffers from a terminal disease, and there is no hope of a cure. However the dying process may take years. “With patients of Alzheimer’s the process may take seven to 12 years,” says Dr Syed. The aim of doctors and family, at this stage, is that the quality of life be improved and the patient be made comfortable. “In Pakistan you get drugs like heroine everywhere but intravenous morphine is not available to a dying patient to help relieve a dying patient’s suffering,” says Dr Syed, explaining the obstacles. To see a loved one in pain takes its toll. “Till my father had the accident, I was a carefree guy. I can safely say I aged at least 10 years within days. I have lost a lot of hair ever since. I do feel depressed inside at times but I cannot afford the luxury to sit and cry because the responsibility of my family is on me,” says Qazi. The biggest challenge, then, is to not give up hope. Posted in Health, Pakistan and tagged caregiver, Dementia, Dr Nadir Ali Syed, Dr Saniya Sabzwari, geriatric, geriatric and palliative care, geriatric care, old people, Pakistan, Parkinson's. Bookmark the permalink.